Soak raw rice,urad dal and fenugreek seeds for 4-5 hours. Wash and grind to a smooth batter by adding cooked rice and water. Keep the batter for fermentation in a warm place for about 8-10 hours( or overnight). Heat a non stick pan, pour a ladleful of batter at the centre. Spread the batter with the back of the ladle to form a circle. Cook until it is done on both sides...Serve hot with sambhar and chutney..
Sending this to Kerala Kitchen Event hosted by Julie @ Erivum Puliyum..
Dosa... my mouth is watering..wish I could eat it now..
Dosa looks yummy with all those side dishes...Nice post dear. New template looks great..Wonderful platter. 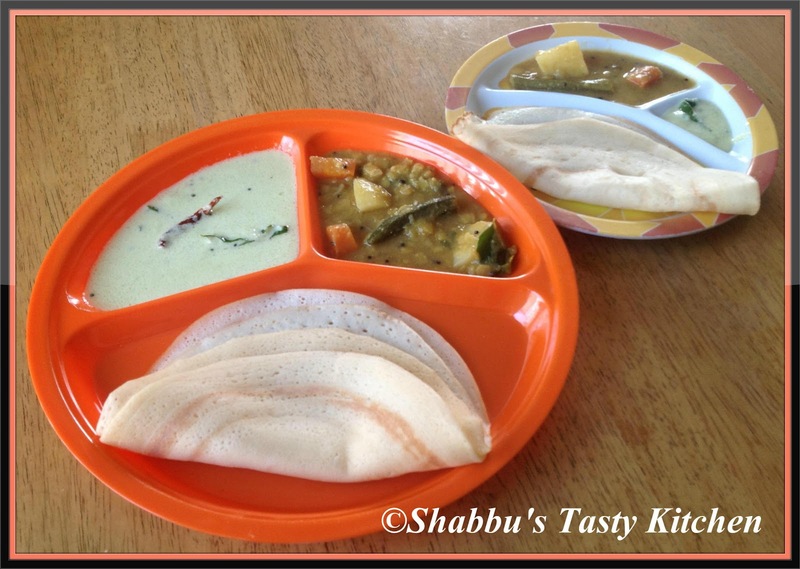 Dosa looks yummy..perfect sidedish for dosa.. It's morning here in Canada and I wish I could grab that plate for my breakfast. Thanks for dropping by my blog. Glad to follow you too. Love dosa's and recently started making it from scratch and my mom gave me this exact ratio of rice and dal to use...It works great! hi shabbu..can yo theu pls post the chutney recipe too..